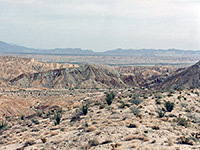 The southern half of Anza-Borrego Desert State Park - that below CA 78 - is reached by just one paved highway, county road S2 which starts at Ocotillo on interstate 8, crosses the southern tip of the park, follows close to the west edge for a while then heads off to join CA 79 - see park map. 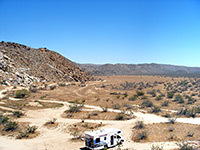 This area was first protected as Anza State Park in 1941 (named after Juan Bautista de Anza, the famous Spanish explorer of the eighteenth century), being joined with the northern Borrego State Park 16 years later. The far south is dominated by the rather barren Jacumba and Tierra Blanca mountain ranges, each with several peaks over 4,000 feet and scattered features of interest like palm groves, mines, lava flows and volcanic hills. The road passes by the mountains along a wide, cacti and ocotillo-filled valley, gains height steadily then follows a ridge with several viewpoints of the Carrizo Badlands - a large area of painted hills devoid of vegetation, the far side of which can be reached from the Split Mountain Trail near Ocotillo Wells. Many 4WD tracks enter the wilderness, one leading along Canyon Sin Nombre, a geologically interesting region whose attractions include slot canyons and mud caves. - small park based around several hot springs, with a campground, general store and four miles of trails. - a wide grassy plain dotted with creosote bushes and ocotillo, crossed by good quality gravel roads leading to many good locations for primitive camping (some suitable for RVs). This area is of interest mainly for its historical sites - a remnant of the Butterfield Overland Stage Route of 1849, Indian pictographs, Marshall South Home (an adobe homestead dating from 1932), and morteros (Indian grinding holes). 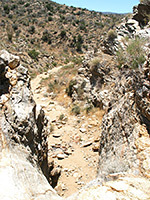 - a shallow but steep sided ravine used as a pass by the Butterfield stage route. It is said that wagon tracks dating from the nineteenth century may still seen be along the valley floor. A short path leads from a pull-out along the highway across cactus-covered ground to a viewpoint beside a 20 foot pour off in the canyon. - a high desert valley, carpeted by agaves and juniper bushes; site of an old gold mine. 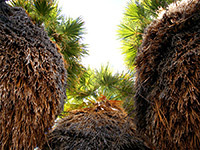 Mountain Palm Springs - branched desert canyons containing six groves of California fan palms. - 71 acre park featuring a reconstructed stage station, plus a primitive campsite.